“Avian diphtheria” in penguins: more questions than answers, I’m afraid. 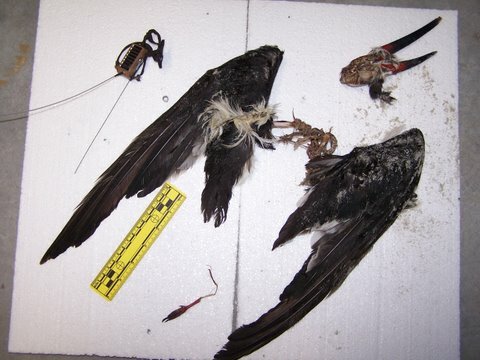 First off, you may notice a new field in our database next time you report a dead bird. “cable tie number, if applicable” now appears in the section on how you marked your carcass. We have sent individually numbered cable ties to a subset of volunteers to begin tracking individual carcasses. The numbered ties will allow us to determine how long a specific bird remains on the beach, or whether birds wash out to sea after being tagged and subsequently wash up on a different SEANET beach. If you have received the numbered ties, please report the number you placed on the bird in this new field. Eventually, we hope to get numbered ties to all our volunteers, and we are excited to see what the data from this new method will show. 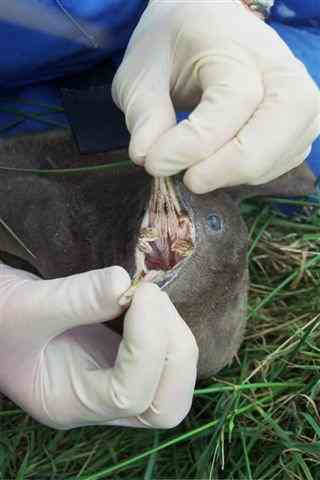 Lesions in the mouth of an affected penguin chick. But what is the infection? Now, some seabird disease news: Yellow-eyed penguins on New Zealand’s Otago Peninsula are suffering from an outbreak of avian diphtheria. “Avian diphtheria” is a term loosely applied to a couple of very different infections. It can be applied to an avian pox virus, which leads to wart like growths either on unfeathered skin (like the feet or around the eyes) or inside the mouth and throat. Avian pox is highly contagious, and can be transmitted by mosquitoes, or by direct contact between birds. The virus survives for a remarkably long time in the environment, and virus-containing scabs that drop to the soil can remain infectious for months or even years. “Avian diphtheria” is also sometimes used to refer to infections with bacteria called Corynebacterium diphtheriae. This bacterium is the one that also causes human diphtheria, and leads to a leathery membrane forming in the throat. The bacteria also produce a toxin that can lead to organ failure. In this penguin report, it is unclear which of these infections is suspected. No laboratory results are yet available. Some of the chicks have been taken in to medical facilities. News reports state that the birds are being given antibiotics and fluids. If the infection is a pox virus, then the antibiotics are presumably to stave off any secondary bacterial infection, since the drugs have no effect on the virus itself. If Corynebacteria are involved, then the antibiotics will be used to treat the infection directly and reduce the effects of the bacterial toxin. Perhaps the greatest risk to the birds is starvation and dehydration, since lesions in the mouth and throat can make swallowing excruciatingly painful. With supportive care, officials expect most of the chicks to survive. If more information on the nature of this infection and its potential effect on the penguin population become available, you can be sure that your SEANET blogger will share it with you, since she is a serious bird disease geek, and really wants to know what these birds actually have. Rick Keup, who walks for us on Fripp Island in South Carolina made a very unusual find this month. A Black Skimmer in multiple pieces washed up on his beach, and the pieces included a banded leg, and a satellite tracking transmitter that had once been attached to the bird via a harness. Scientists use these satellite trackers to learn about an individual bird’s migration patterns, and even day to day foraging locations or favored night-time roosts. Seabirds are often tagged with the devices when they arrive at breeding islands to nest. The devices can be removed the following year when the bird returns to the colony. The tags are, not surprisingly, quite expensive, and scientists can afford to place them on only a small subset of the birds they study, or even band. So the odds of finding of a satellite tagged bird seem lower than finding the proverbial needle in the haystack. It appears that Rick has done just that. When we get details on this bird (once the band is reported) we will let you know the history of the bird, when it was tagged, and perhaps even be able to share with you a map of where the bird traveled while wearing the device. This find is a SEANET first, and a very cool one. Thanks Rick! Your SEANET blogger will likely be taking a Thanksgiving hiatus for the remainder of the week, and I wish you all a Happy Holiday, and hope you enjoy a dead bird of an altogether different sort this Thursday. Mike Bjornholm walks Corporation Beach in Dennis, Massachusetts. Corporation Beach, known to us as WB_45, is located about mid-bicep on the flexed arm that is Cape Cod. When Mike walked his beach on November 13th, he found a few dead birds, and he also provided us with a fine example of the SEANET data collection methods at work. An eider initially tagged on another SEANET beach washed up on WB_45! Mike found a couple dead Common Eiders (a typical find this time of year on the Cape), as well as a dead Thick-billed Murre. He also found an additional Common Eider with a SEANET orange cable tie through its nostrils. 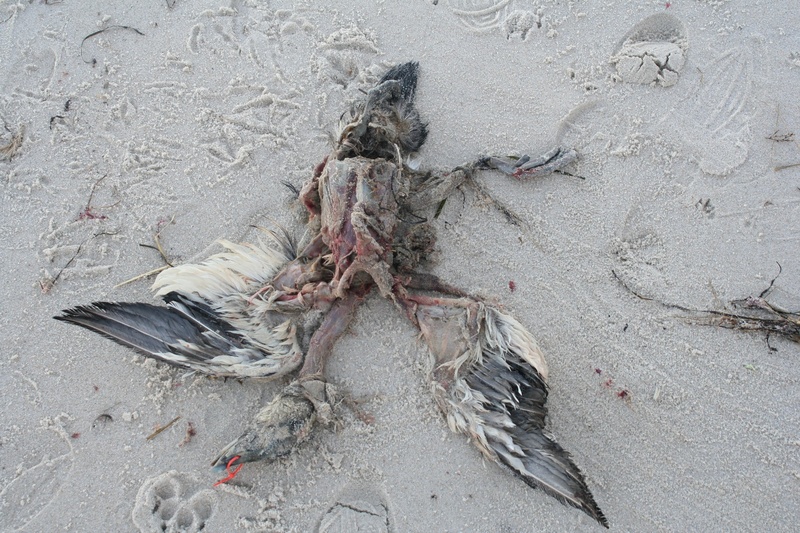 This was not a bird that Mike had tagged, which means the carcass made a previous appearance on another SEANET beach, was washed back out to sea, and then deposited on Mike’s beach. This sort of recycling of carcasses is something we have long suspected might occur, but before we began using the cable ties, we could never know for certain. Now we do! The next step will be to obtain individually numbered cable ties for all of our volunteers so we can determine the exact path tagged carcasses follow. Such numbered ties are being used on a limited basis by a few Seanetters, including Dennis Minsky in Provincetown, MA. We hope to widen the scope of this experiment soon, sending the ties to a few volunteers in Maine as well. Mike also sent along photos of a dead seal he saw on his beach which had been tagged by the local stranding network, and he sent a picture of a subadult Northern Gannet he found just outside his official SEANET territory. We commend Mike for not formally reporting a bird outside the limits of his walk, as that would artificially inflate our carcass encounter rate, but we always welcome informal reports of such things via email, and are always happy to see photos of anything interesting, live or dead. Dead seal on WB_45. 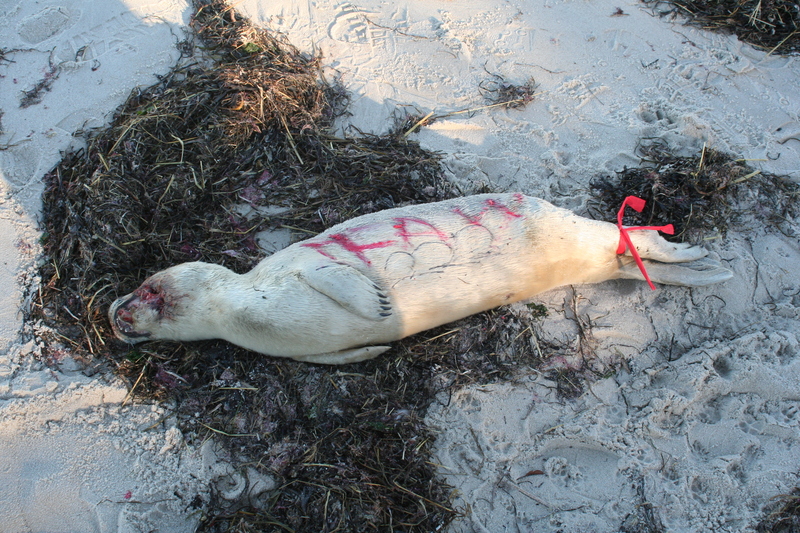 The carcass was tagged by the International Fund for Animal Welfare (IFAW). Finally, a note about a earlier post, in which we asked your opinions about a photo of a gull with a bizarre yellow encrustation on its legs, tail and wingtips. Helen Rasmussen, who walks for us in Maine, thought the material looked like spray foam insulation. Your SEANET blogger thought the very same, as did a few other people who looked at the pictures. The question then would be, how did the bird get into such stuff? But really, isn’t that always the question with gulls? Check out these naked chicks! 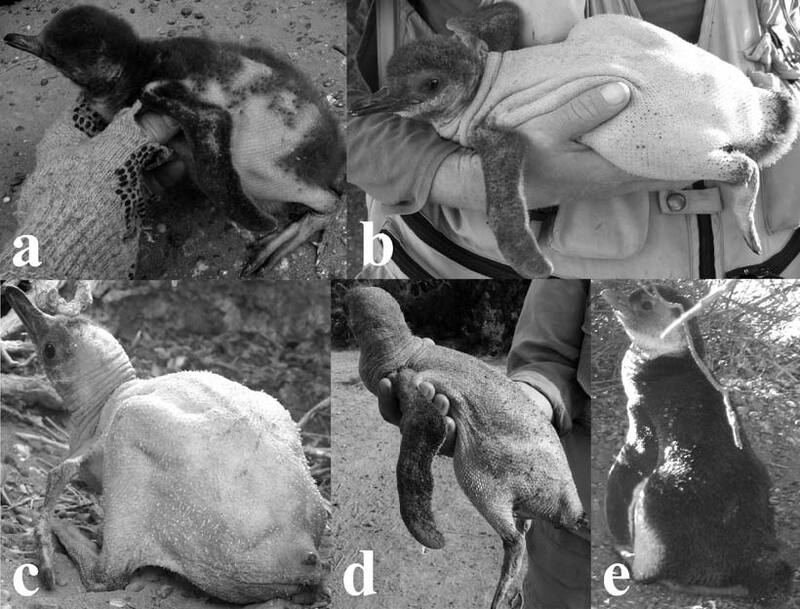 A new study out in the journal Waterbirds reports on an apparent disorder in feather development in African Penguins (Spheniscus demersus) in South Africa and Magellanic Penguins (Spheniscus magellanicus) in Argentina. The abnormalities were first observed in 2006 among African Penguin chicks raised in the SANCCOB rehabilitation center in South Africa. In both species, the normal sequence of feather development involves loss of the hatching down as a second downy coat grows in. That down is subsequently replaced by juvenile feathering. At no time is bare skin exposed during normal feather development. In the rehab center, birds with the disorder lost their down and it was not replaced with new down or juvenile feathers for some weeks, leaving the birds looking like plucked chickens for an embarrassing period of time. The disorder did not lead to any deaths, and all the birds ultimately went on to grow normal juvenile feathers. However, affected birds took longer to attain a healthy weight for release, and were smaller overall than their unaffected counterparts, suggesting that the disorder has a detrimental effect on the bird’s overall energy balance. A year after being detected at the rehab facility, the disorder was seen in Magellanic Penguins in the wild, and two years after that, in a wild colony of African Penguins. The number of birds affected in the wild colonies was far lower for both species than in the rehab setting. The authors of the journal article suggest that this is because of the close quarters in a rehab facility, which may encourage the spread of any infection involved in the disorder. The SEANET blogger would argue for consideration of another factor: birds taken in by a rehab center may not be the fittest individuals in the population, and may be more prone to disorders and diseases of any cause. In any case, your blogger is also interested in seeing what further work is done on the subject. Hopefully, some diagnostics (skin scrapings or biopsies, for instance) will shed at least some light on this mysterious malady. There is a lot still to be discovered about this, and SEANET will spread the word as additional studies appear. From time to time, our intrepid Seanetters look up from the carcass-littered beaches and observe a living bird, or some other item of interest. Occasionally, Seanetters even go on vacation. In recent days, I have gotten emails from three Seanetters who sent along interesting or unusual sights, and we also received a very bizarre photo on which we’d like your thoughts. Here is our photo gallery of varied curiosities. 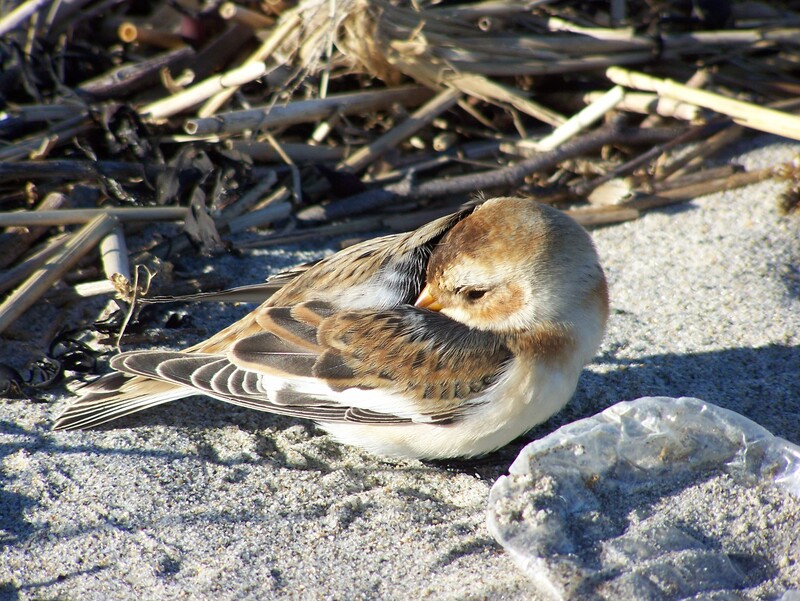 Seanetter John Galluzzo stealthily crept up on this napping Snow Bunting on his beach in Scituate, MA. Less attractively, a plastic bottle was roosting next to it. 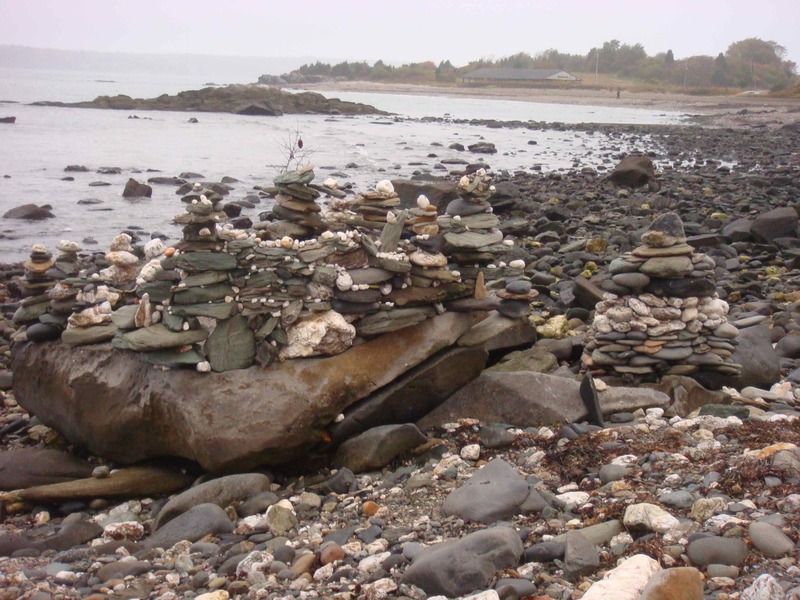 Marcie Lindsay encountered this elaborate construction on Fort Getty Beach in Rhode Island. The work of aliens? Most definitely. 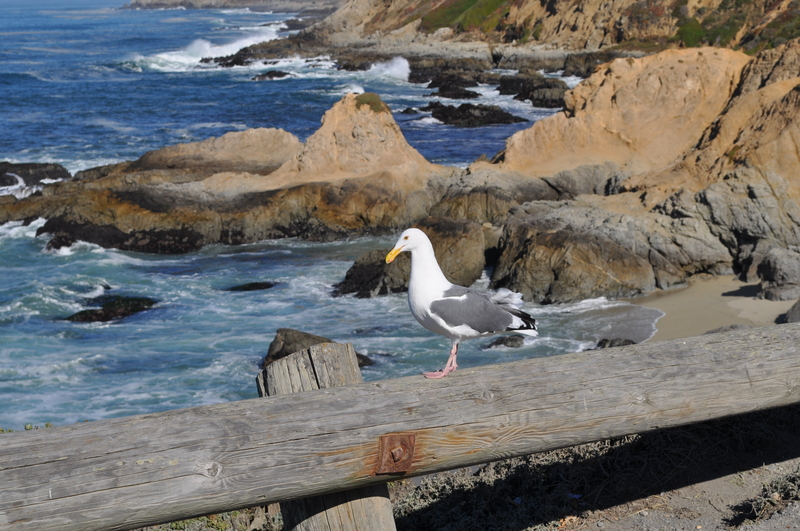 Martin Vanoy photographed this Western Gull at Bodega Bay, California. He was visiting family on a welcome respite from the miserable climate in Florida where he normally walks for us. Finally, the photo on which we’d like to solicit your thoughts. 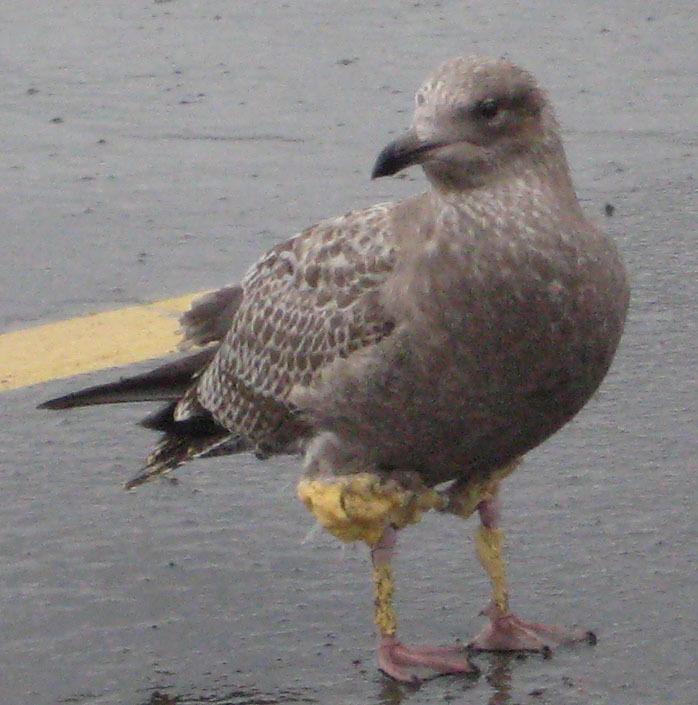 Bruce Parsons of Nova Scotia, Canada, observed a gull with irregular yellow material on its legs, wings and tail. He sent the pictures to gull researcher Ken Mackenzie in Massachusetts who had some thoughts (which I will not reveal lest they bias your own musings.) Through Ken, the photos reached SEANET, and we here present them to the vast group intellect of Seanetters and ask you to post your thoughts. There is no definitive answer on this, so we welcome any ideas you might have. Who can say how gulls get into the trouble they do? 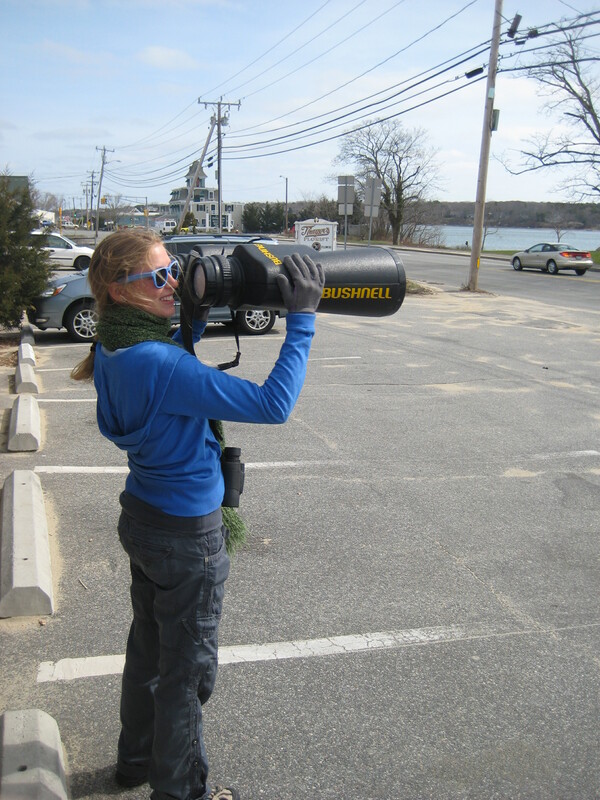 When it comes to birding, Ashley ascribes to the "go big, or go home" school of thought. 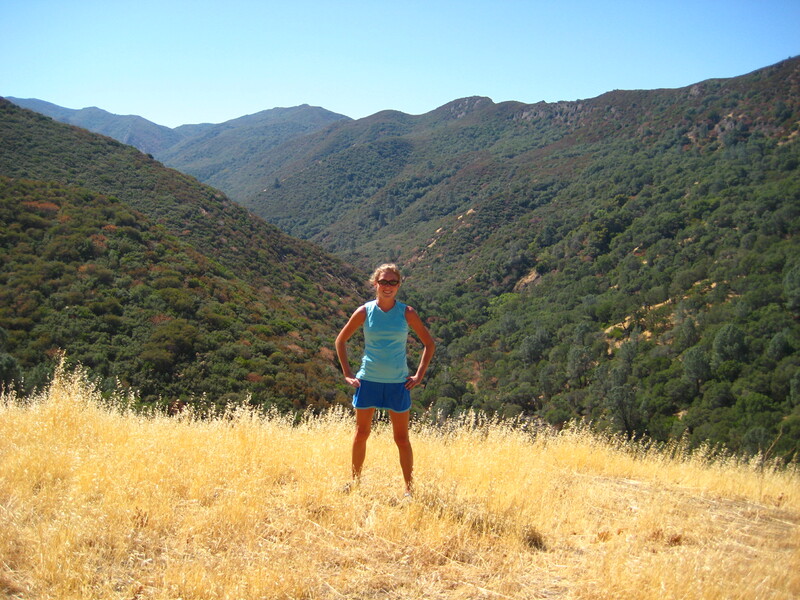 Ashley summits mountains and barely breaks a sweat. So a mountain of dead eiders is no big deal. Clearly some sort of superwoman, we are glad Ashley deemed our eider project worthy of her commitment and attention, and when she’s done with us, we wish her luck with her next adventures this Fall! And now, the dead bird thrills continue with the answers to Tuesday’s DBQ. Two DBQ devotees piped up on this one; John “Quick Draw” Stanton lived up to his name, posting his guesses within approximately 30 seconds of the Quiz appearing. And Mary “Dark Horse” Wright offered her own thoughts. Both were correct on Bird A for sure, which is a Snowy Egret. Though the bird is in rough shape, the giveaway is the black legs with vibrant yellow feet, setting it apart from other white egrets like the Great Egret, or white morphs of Great Blue Heron or Reddish Egret. Bird B is a trickier one. Both John and Mary thought it was a Ring-billed Gull wing. 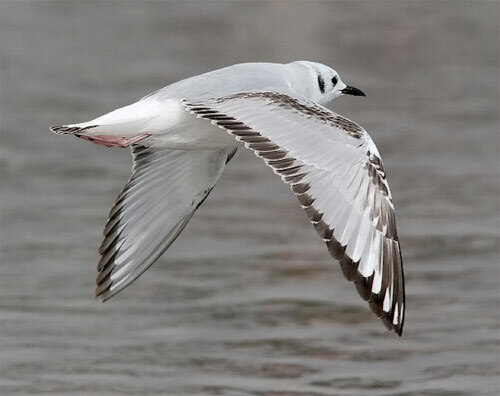 I would like to argue for subadult Bonaparte’s Gull. Take a look at the photo of Bird B in the last post and compare to this photo of the living, subadult Bonaparte’s. Young Bonaparte's Gull. Photo by J. Poklen. There are definite similarities between the RBGU and BOGU, but our specimen shows less of the solid dark color of the RBGU’s primaries, and in the BOGU, the feathers alongside the dark, outermost primaries are a much more striking white than in the RBGU. 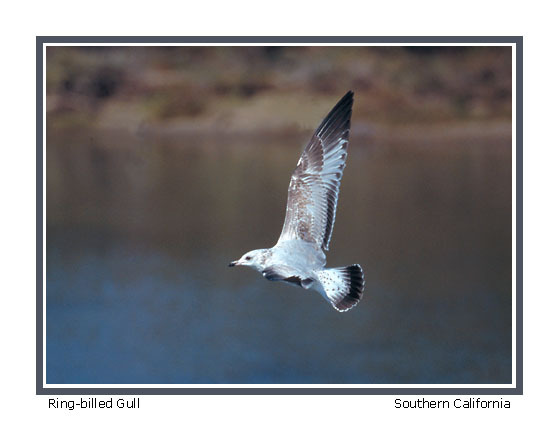 Compare with the young Ring-billed, whose wing shows more brown and less of the pure white of the Bonaparte's. As I have said before, I claim no title to Dead Bird I.D. Expert, so I am open to persuasion, but I hope I have successfully explained my position on this one. 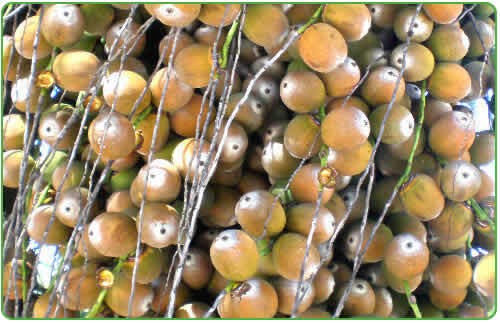 “Sea-beans (also known as drift seeds) are seeds and fruits that are carried to the ocean, often by freshwater streams and rivers, then drift with the ocean currents and (hopefully!) wash ashore. These sea-beans don’t initially come from the sea and while some are indeed beans, many are not technically beans at all! 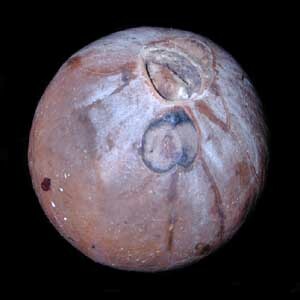 Some “sea-beans” are technically fruits that contain seeds. Nonetheless, if they drift to and into the oceans and wash ashore, we collectively refer to them as “sea-beans”.